The new Maersk Tower was officially opened today in the presence of HM Queen Margrethe II. The exclusive setting marks a new chapter for health research in the Faculty of Health and Medical Sciences at the University of Copenhagen. The University of Copenhagen added 42,700 square metres of floor space when the 75-metre-tall Maersk Tower was officially opened today. 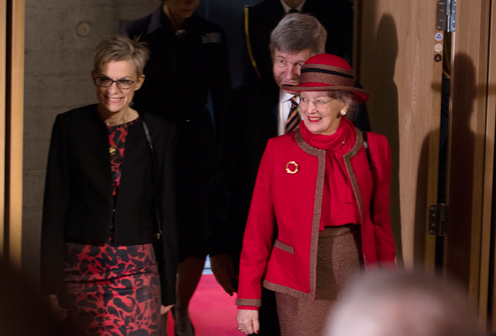 The opening ceremony was attended by HM Queen Margrethe II, representatives from the A.P. Møller Foundation, architects C.F. Møller, the Danish Building and Property Agency, the University of Copenhagen and many other visitors. The imposing copper tower, with its innovative architecture and modern facilities, will become an important centre for world-class health research in Denmark. Its modern teaching facilities will also bring new vitality to the student environment. "The opening of Maersk Tower marks a milestone for health science research at the University of Copenhagen. The new tower gives our researchers the opportunity to create new knowledge using highly specialised laboratory facilities, and our students can enjoy ultramodern auditoriums and recreation areas. Maersk Tower creates the best conditions for research and education at the highest international standard, and will play a key role in health in Denmark in future," says Dean Ulla Wewer from the Faculty of Health and Medical Sciences at the University of Copenhagen. A central idea behind the architecture of Maersk Tower has been to give researchers and students the best possible setting in which to create and acquire new knowledge. The focus has been on an open environment that encourages interdisciplinary collaboration and dialogue. All floors therefore contain a 'researcher square' at their core, serving as a social gathering point for research groups to meet and exchange ideas. Another important aim has been to create ultramodern laboratory facilities, so the research can draw on the latest technologies and most advanced solutions. "Maersk Tower's open connections between floors break with traditional laboratory layouts – typically limited to horizontal plan solutions – making it ready to cater for the way research is organised in the future. The primary focus has been to create a boundary-less, flexible and stimulating research community, spanning institutions, departments and external cooperation partners. At the same time, the exterior architectural design seeks to create a sustainable landmark which interacts with the city and university in a new and open way," says Mads Mandrup Hansen, partner and architect at C.F. Møller. Most of the floors house advanced research, and the building is therefore designed to be completely stable. The building core was cast on site, so the city vibrations will not affect the research activities. The tower is also one of Denmark's most energy-efficient buildings, with recycling of waste energy and climate-friendly district cooling. "The opening of Maersk Tower is a big day for the Danish Building and Property Agency. We have completed one of our largest construction projects to date, and researchers and students will soon be able to move into the tower and the associated base buildings. Construction has taken six years since the international project competition in 2010. The construction site was established in 2012, and the concrete skeleton and façade was built in 2013 and 2014. The building complies with low-energy class 15, and is packed with modern technology for electricity, water, heating and ventilation, and to service the many laboratories in the building. We look forward to handing over the building to the University of Copenhagen, so the many researchers and students can start to enjoy the amazing new setting," says Building and Property Agency Director, Gyrithe Saltorp. Maersk tower is the University of Copenhagen's ultramodern research tower. The 15 storeys house the best possible facilities for research and education in the health sciences. The building was designed by C.F. Møller, and is a new landmark in Copenhagen Science City, with its sculptural architectural style. The design of Maersk Tower's structure, its technical systems and other engineering tasks have been managed by Rambøll. A new public campus park is being established around Maersk Tower that will offer outdoor study and recreation areas for researchers and students, and new green outdoor experiences for all Nørrebro residents. The campus park has been designed by SLA. The Danish Building and Property Agency commissioned and owns the building, on behalf of the Danish Government. Maersk Tower was made possible by a generous donation from the A.P. Møller og Hustru Chastine Mc-Kinney Møllers Fond til almene Formaal (A.P. Møller Foundation), and a special grant from the Danish Parliament. The Sugar Theatre exhibition – created by Morten Søndergaard in cooperation with the Laboratory for Aesthetics and Ecology – is being launched in connection with the official opening of Maersk Tower. Sugar Theatre explores differences and similarities between the way science and art perceive and describe the world. The exhibition is located next to Maersk Tower in Vandrehallen, in the Panum Building.